I have always enjoyed a G&T. I have my favorite brands, not only of gin, but also of tonic. But I have noticed that there is a whole slew of them now. So, how do I know which ones are made properly, and which ones are just alcohol and flavor, without buying and tasting each one in turn? a clear alcoholic spirit distilled from grain or malt and flavoured with juniper berries. So your differentiation between "made properly" and "just alcohol and flavor" is meaningless. Many of the finest gins are made by steeping juniper berries and other botanicals in the distilled spirit. Others are created by passing the newly formed vapour through a "botanicals basket" prior to condensation. Whichever way they are created, they are still gin. I'm not sure what you mean by properly, but it seems like you mean "that you would like". You could try reading http://theginisin.com/ and getting a feel for if you agree with the reviewer based on what you currently like, then use his reviews as a jumping off point either positively or negatively. However, I believe that the only truly valid way it to try them. That said if your mixing the gin with tonic(and perhaps a lime), there is probably very little chance you can taste the difference. Many people think they are alcohol connoisseurs, but in truth very few are -it take real practice and training. This idea has fascinated me for a long time and working over a decade behind a bar has given me insight. It rings true for every kind of alcohol, varietal of wine, and type of beer. Most people can not tell the difference. What I have here is anecdotal, but perhaps it can help to inform you. I worked at a square bar with a partition in the middle(you could not see across the bar completely). On occasion we would run out of something, bud light, Kendall Jackson, Patron, Crown, Tanqueray, Grey Goose etc. If it wasn't too busy, On the order side of the bar, I would make the person something similar: miller light instead of bud, Cuervo Silver instead of patron, Rail gin instead of Tanqueray, smirnoff instead of Grey Goose. I would let them try it for a bit and then have another bartender ask what they were drinking under some pretense. Never once did anyone notice or at least speak up, and this happened easily more than 100 times. Afterwards I would tell them my "mistake" and offer to not charge them for the drink or buy them a round of the correct brand. Less often, but still on occasion(dozens of times) I would hear someone talking about how only brand X will do and everything else is trash. I would tell them that I don't think they can tell the difference and that I was willing to make a bet. Their humiliation against a free drink. I would fill 3 small glasses with enough liquor for a taste. I would then put the bottle for their brand and two other bottles of a similar liquor in front of them. The bet? They have to tell me what liquor is in each glass. If they can, then they get a free shot(or sometimes more than one), if they can't they have to admit they can't tell the difference. I would fill all three glasses with their favorite brand(never said I would use all three bottles). If there was a mixer involved, not a single person figured it out, even though a very large portion of players were certain they were right. If the liquor was straight up, then about 10% - 15% could figure it out. I'm not saying there are no taste differences between gins- there are. For the uninitiated though, they are difficult to detect straight. When you mix it with tonic(or another mixer) many of the differences are completely lost and only practiced connoisseurs will be able to detect what they are specifically drinking. Based on your question, it does not appear you fall into this category(most of us don't). Mostly what you are getting with a certain brand is a feeling from ordering it, not a distinct flavor profile. In that light, let go of the importance of taste and try to consider feeling. Ask yourself, what feeling are you trying to get for yourself? You want the bartender to think well of you? You want to feel like you are drinking something made with high quality methods? You want to feel superior to others? You want to recapture a memory? You want to seem cool? You want to impress someone? You want to feel like you are getting your money's worth? Want to spend as little/ as much as possible? Let the feeling you are chasing help you choose the right brand. 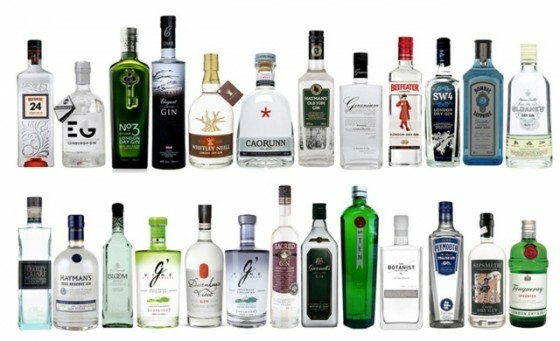 Alternatively, you could go about tasting all of these gins in order to gain the actual skill to know the difference. However, this will take years and doesn't have much use in regular bar drinking. These stereotypes may very by locale, but just as a starting point: Want to seem urban tough, try Tanqueray. Want to seem urban sophisticated, try Tanqueray 10 Want to seem like you know a good classic, try Saffire. Want to show working class grit, try beef eaters or gordon's or rail. Want to seem informed or hip (depending on whats available), try Caorunn, Hendrix, or anything local or "small batch". I expect I may get some kickback from some folks about difficulty of tasting the difference and I say to you prove me wrong. Perform a blind taste test- mark the bottom of the glass with a label facing down and make sure to put multiples of the each brand in order to make sure you actually able to tell the difference and not just guessing correctly. Also, here is a link to relevant article(for wine not gin) that concludes that people can not tell the difference in brands. Not the answer you're looking for? Browse other questions tagged flavor taste gin or ask your own question.